Laminins are major components of all basement membranes surrounding nerve or vascular tissues. In particular laminin-111, the prototype of the family, facilitates a large spectrum of fundamental cellular responses in all eukaryotic cells. Laminin-111 is a biomaterial frequently used in research, however it is primarily isolated from non-human origin or produced with time-intensive recombinant techniques at low yield. 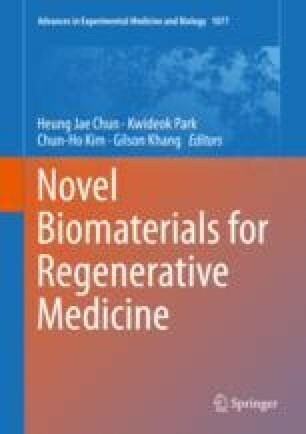 Here, we describe an effective method for isolating laminin-111 from human placenta, a clinical waste material, for various tissue engineering applications. By extraction with Tris-NaCl buffer combined with non-protein-denaturation ammonium sulfate precipitation and rapid tangential flow filtration steps, we could effectively isolate native laminin-111 within only 4 days. The resulting material was biochemically characterized using a combination of dot blot, SDS-PAGE, Western blot and HPLC-based amino acid analysis. Cytocompatibility studies demonstrated that the isolated laminin-111 promotes rapid and efficient adhesion of primary Schwann cells. In addition, the bioactivity of the isolated laminin-111 was demonstrated by (a) using the material as a substrate for outgrowth of NG 108-15 neuronal cell lines and (b) promoting the formation of interconnected vascular networks by GFP-expressing human umbilical vein endothelial cells. In summary, the isolation procedure of laminin-111 as described here from human placenta tissue, fulfills many demands for various tissue engineering and regenerative medicine approaches and therefore may represent a human alternative to various classically used xenogenic standard materials. The work was performed at the Ludwig Boltzmann Institute for Experimental and Clinical Traumatology; Austrian Cluster for Tissue Regeneration, Donaueschingenstraße 13, 1200 Vienna, Austria. The authors acknowledge Red Cross Blood Transfusion Service, Linz, Upper Austria for providing the placenta tissue, Dr. Wolfgang Holnthoner, Severin Mühleder, MSc, for providing the HUVEC and Mag. med. vet. James Ferguson for reviewing the manuscript. This work was partially funded by the City of Vienna Competence Team Tissue Engineering Signaltissue (MA23 Project-#18-08).